Leaking gutter repairs – it fair to say the whole area of poor property repairs and maintenance often comes down to lack of attention to one of the biggest causes of damage to a property, and that is leaking cast iron or plastic guttering (UPVC) also soil stacks. 9 times out of 10 it’s blocked or full guttering that causes damp damage to properties. 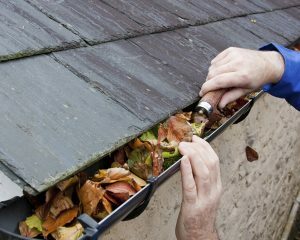 Clearing the guttering of leaves or moss and general debris is probably one of the most important annual maintenance jobs a property owner should do. However, it’s important that it’s done correctly. What is mean by that is, quite often heavy ladders are placed on the guttering, and if you are not careful this can cause seals to break, resulting and cracking and leakages. While this issue mainly arises on UPVC guttering, damage can also be caused on cast-iron guttering, which can be very costly to overhaul and replace. So light ladders and gentle placement on the guttering is important, and where possible ladders should be placed as as close to the brackets as possible when cleaning out guttering. Blocked gutters and blocked downspouts can cause untold water damage, but if your gutters are regularly cleared the downspout will normally also stay clear. Nevertheless, occasionally objects can get into and block the guttering downspout. With plastic UPVC downspouts its relatively easy to dismantle and unblock them, as the downspouts fittings and joints are push-fit and easy to dismantle and re-assemble again. Blocked cast-iron gutters, on the other hand, can unfortunately result in quite a bit of work, especially if the blockage is a bad one eg. a tennis ball. Removing such items can often require a complete dismantle of the pipework, and inevitably joints will get cracked or broken and replacements are often required. Leaking gutters and repairs – quite often if a joint is leaking this is often due to a failed joint seal, or it can be the result of joints that have incorrectly fitted. Leaking gutter and repairs all are relatively easy to deal with, especially if its (UPVC) plastic and is easy to access. It should be relatively easy to remove and repair or arrange for the replacement of gutters and down spouts. Cast-iron guttering and downspouts can be problematic – if you are resealing a leaking cast-iron joint, you have to grind off the old gutter bolt as these tend to rust and fuse together. In addition, when re-making a new cast-iron joint this can can cause other joints to break further down the piping and this can require more cast-iron guttering to need replacing. The traditional way of replacing a leaking cast iron gutter is to remove the gutter bolt, clean the joint out, paint with joint paint, apply a deep bed of putty and tighten the joint bolt to squeeze the excess joint putty out, then paint back to original color. Any problems with a leaking gutter and repairs, please call A C Joinery for advice and an estimate. We are based in Hale and can provides building repair servcies across the South Manchester, Chesire regions, including Sale, Brooklands, Timperley, Wythenshawe, Gatley, Cheadle and other local areas.